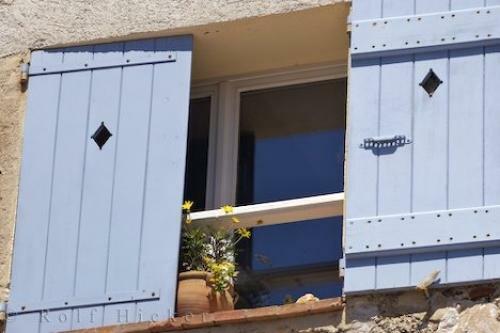 A typical french building featuring blue shutters and a terracotta pot on the window sill in the quaint village of Gourdon, Provence, France. Blue window shutters on the Provencale Restaurant in the square - Place Victoria in the village of Gourdon, Alpes Maritimes, Provence, France, Europe. Provencale Restaurant in Gourdon, Provence, France.